Mineral sunscreens are one of the most effective forms of UV protection that are available to the public. Today, there are many options available at drugstores and even in supermarkets. But did you know that not all natural sunscreens are safe? It’s true, just because a product contains mineral sunscreen ingredients does not mean it is free from harsh chemicals, including chemical sunscreens. So, what features should you look for in a safe, mineral sunscreen? Mineral Sunscreens are made with mineral sunscreen ingredients, which are para-aminobenzoic (PABA), zinc oxide and titanium dioxide. Both ingredients create a physical barrier on the skin that blocks both UVA and UVB rays. Unlike chemical sunscreens that take around 30 minutes to become effective, mineral sunscreens are effective right after applied. Many brands have been adding mineral sunscreen ingredients to their sun protection products for years. The issue is that they are just adding the ingredients to old formulas, instead of formulating a natural mineral sunscreen. Most of these sunscreens still have the chemical sunscreen ingredients, preservatives and other harsh chemicals in them. Like other chemicals in body care products, the ingredients in chemical sunscreens accumulate in breast milk and body fat. These chemicals have also been linked to hormonal disruptions, low sperm counts, and allergic reactions. The major issue of using chemical sunscreens is that they are less effective at protecting you against harmful UV damage. Chemical sunscreens work by absorbing UV rays, which allows UVA rays to penetrate deep into the skin. UVA rays are the ones that cause wrinkles and skin cancer. There has also been research completed that shows that some chemical sunscreens oxidize under the sun’s rays, which increases the potential of free radial formation and this increases a person’s risk for wrinkles and skin cancer. Chemical sunscreen ingredients include Avobenzone, Homosalate, Octocrylene, Octisalate, Octinoxate, and Oxybenzone. Should I Buy Natural or Organic Sunscreen? Natural has become a popular marketing word, even though many products labeled with ‘natural’ still have harsh chemicals in them. The best option is to buy a mineral sunscreen that is made with organic ingredients. There are three levels of organic labeling. “100% Organic” means that a product is made only using certified organic ingredients. The “Organic” label is for products that are made with at least 95% organic ingredients. “Made with organic ingredients” are products made with at least 70% organic ingredients. “100% Organic” and “Organic” products may have the USDA Organic seal, but “made with organic ingredients” may not carry a seal and can have up to three certified organic ingredients printed on the front label. However, products made with less than 70% organic ingredients can only list the organic ingredients on the back label. How to find the Right Sunscreen for You and Your Family? Depending on where you are shopping, there could be dozens of options of sunscreens for you to pick from. Even if you decide that you are going to buy a mineral sunscreen, you will still have many options to pick from. 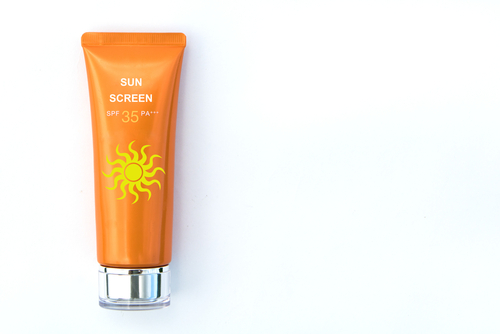 Many times, deciding which sunscreen is right for you can be overwhelming. Here is a list of features you should be looking for. However, this equation is not always accurate because most of us do not use the amount of sunscreen we really need. Researchers say that the amount of time calculated using the above should be halved in order to better protect your skin. Above we mentioned that SPF only is how much a sunscreen protects you from UVB rays. Sunscreens that protect from UVA rays are labeled as Board Spectrum. Some sunscreens will also say that they protect against UVA, but this is not required. Products are not allowed to claim to be sweat-proof or waterproof anymore. They are only sweat and water resistant for a specific amount of time, which can be either 40 or 80 minutes. The sunscreen may have list the amount of time that they are sweat and water resistant on their label. Just keep in mind that you should also reapply the sunscreen after sweating or swimming and drying off with a towel. The reality is that natural and healthier skin care products have become more popular in the last decade, and many brands are starting to market their products as ‘green’ or ‘natural’. However, many ‘natural’ sunscreens use a combination of chemical and mineral sunscreen ingredients. If you are wondering what is in a sunscreen, you can check the back label of the product. The ingredients that provide UV protection are listed as ‘active ingredients’ and are listed above the other ingredients. Mineral sunscreen ingredients are para-aminobenzoic (PABA), zinc oxide and titanium dioxide. Along with the active ingredients, you should also check the non-active ingredients. These ingredients could hide harsh chemicals or the sunscreen could have allergens. If you are looking for an organic sunscreen, the organic ingredients should be listed as organic at the top of the ingredient list. All sunscreens are required to have an expiration date somewhere on the packaging. This could be stamped into the tube’s closure or be printed on the bottle. Sunscreen is similar to medicine because it starts losing its effectiveness after the expiration date has passed. It is recommended that you do not use sunscreens that are expired as it may not be effective. When you are shopping for a sunscreen, you may find some products that are labeled as “facial sunscreen” or for “kids”. Facial sunscreens often contain moisturisers, are lightweight, non-greasy and are better for sensitive and delicate areas. Nearly all sunscreens can be used on the face, so facial sunscreens are only really helpful if your body sunscreen breaks you out. Kids and Baby formulated sunscreens are developed with kids in mind. They often come in bright-colored packaging but are often times the same product as the adult version. The kid’s formula may have a different fragrance and may not contain chemicals that could cause tearing or stinging. The reality is that you can use the same sunscreen on you and your kids. However, keep in mind that children under six months should never have sunscreen applied to them. Instead, you should use a hat and long-sleeve clothing to keep their skin covered. The cost of a sunscreen is often based on the brand and the store that you are shopping at. Mineral organic sunscreens are often more expensive than other options. However, you can find safe, effective mineral sunscreens at all price points. You need to keep in mind that just because a sunscreen costs more, does not mean that it is more effective. Sun protection is important all year round because the sun produces UV rays every day. The amount of sun that you get per day changes depending on the time of year you are outdoors. You should apply sunscreen before spending any amount of time outside, no matter what type of sunscreen that you pick.